Above is a design of a property name and address sign. 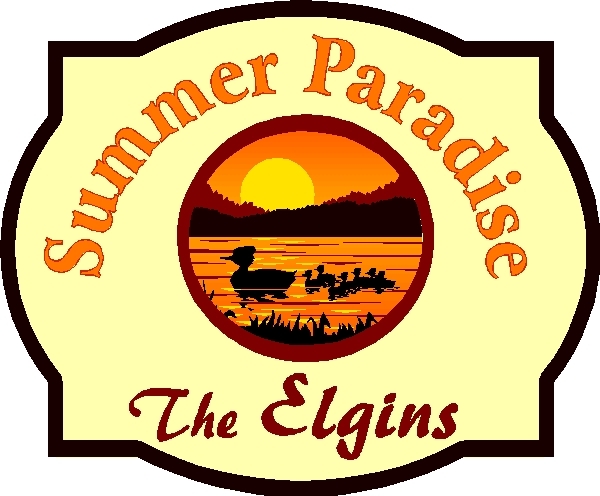 This property name sign features a carved 2.5-D flat relief multi-level scene of a lake, forest, sunset and mother and baby ducks. Four depths of flat relief are carved with the border, text, and scene are elevated at various levels above the yellow background (smooth texture). After hand-painting, the sign is clear-coated twice. This sign can be mounted on a door, an adjacent wall, on a metal or wood post, or hung from a wood or iron hanger.